Upon discovering that her great-great aunt was the victim and central figure in one of Illinois’s most notorious crimes, author Susan Elmore set out to learn more. She uncovered a perplexing case that resulted in multiple suspects, a lynch mob, charges of perjury and bribery, a failed kidnapping attempt, broken family loyalties, lies, cover-ups, financial devastation, and at least two suicides. In Narrating the News Karen Roggenkamp examines five major stories featured in three respected New York newspapers during the 1890s—the story of two antebellum hoaxes, Nellie Bly’s around-the-world journey, Lizzie Borden’s sensational trial, Evangelina Cisneros’s rescue from her Spanish captors, and the Janet Cooke “Jimmy’s World” scandal—to illustrate how new journalism man-ipulated specific segments of the literary marketplace. These case studies are complemented by broader cultural analyses that touch on vital topics in literary and cultural studies—gender, expansionism, realism, and professionalization. Ohio’s original heavily forested landscape included glacial lakes, large rivers, and streams that teemed with an abundant variety of fish, most of which remain resident today. 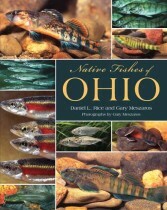 Native Fishes of Ohio documents the more than 130 species originally found in the state and describes how their aquatic habitats have evolved as a result of agriculture and industrial development. There is no shortage of literature addressing the workings, influence, and importance of NATO and the Warsaw Pact individually or how the two blocs faced off during the decades of the Cold War. However, little has been written about the various intrabloc tensions that plagued both alliances during the Cold War or about how those tensions affected the alliances’ operation. The essays in NATO and the Warsaw Pact seek to address that glaring gap in the historiography by utilizing a wide range of case studies to explore these often-significant tensions, dispelling in the process all thoughts that the alliances always operated smoothly and without internal dissent. Conventional wisdom has the Korean War putting the “O” in NATO. Prior to that time, from the signing of the North Atlantic Treaty on April 4, 1949, to the North Korean invasion of South Korea on June 25, 1950, the Treaty allies were just going through the motions of establishing an organization. Historian Lawrence Kaplan argues that this is a mistaken view, and he fills significant blanks in the record of 1949 and 1950, which NATO officials and analysts alike have largely ignored. The virtues of the citizen-soldier are prominent in the history of the American Revolution, but less attention has been given to the citizen-sailor. However, there were state navies during the war, the seaward equivalent of the state militias, and the state of South Carolina put to sea the most important of these. A New Book of the Grotesques (the title is adapted from the first tale in Winesburg, Ohio) does not challenge previous studies of Anderson as much as it looks at Anderson’s early fiction from contemporary interpretative methodologies, particularly from poststructuralist approaches. With this study, author Robert Dunne breaks new ground in Sherwood Anderson scholarship: his is the first sustained, full-length critical work on Anderson from a postmodern theoretical perspective and is the first study of a substantial body of Anderson’s work to be published in more than thirty years.